If this is your first visit to NSVI.org, you might want to start with our Mission Statement. The Founders and first Board of Directors of NSVI have effectively served since 2002. 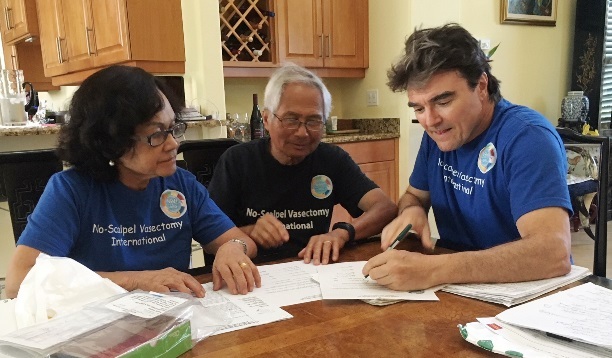 They have tirelessly run missions to provide FREE NSV (No-Scalpel Vasectomy) in developing countries with high rates of unintended pregnancy, they have supported NSVI’s Domestic Teams, they have handled all of the financial and record-keeping duties required of a non-profit corporation, and they have donated generously from their own personal funds. 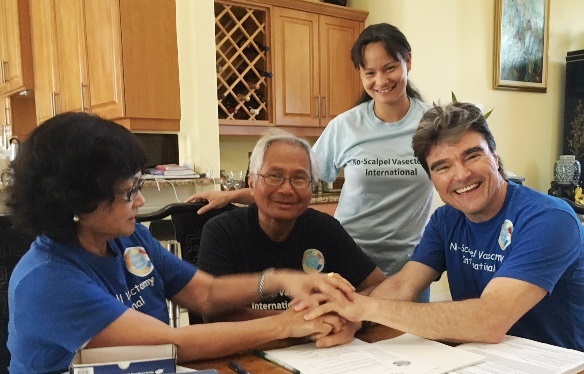 Inspirational role models for most people who meet them, Ramon, Nenita, Bob and Benie have made annual missions to the Philippines for 20 years (since 1998), first with the Bisaya Medical Association until 2001, then as “NSVI” with some support from the BMA. 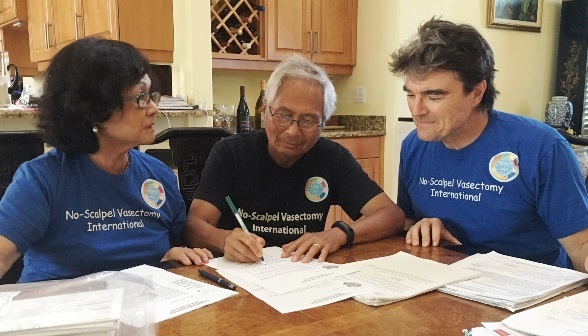 Since I joined NSVI in 2010, Ramon has traveled with me on 29 international vasectomy service and training missions to Philippines, Kenya, Haiti, Indonesia, Cuba, and Mexico; played a key role in 5 World Vasectomy Days; and helped train dozens of vasectomists worldwide. … under the watchful eye of Ramon and Nenita’s grand-daughter Maya. 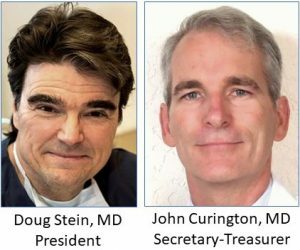 We joined hands, and Doug Stein and John Curington became President and Secretary-Treasurer of NSVI. The transition has involved a transfer of the NSVI non-profit corporation from Pennsylvania to Florida, acquisition of a new accounting firm in the Tampa area, and transfer of management of the NSVI Wells Fargo and PayPal accounts from Ramon to myself. Over the next few months, the Emeritus Board, John and I will nominate others to the Active Voting Board and to a more expansive Board of Advisors. Our goal is to continue the legacy of our Founders and try to match their spirit, energy and vision so that NSVI lives on through generations. Please see the video HERE. 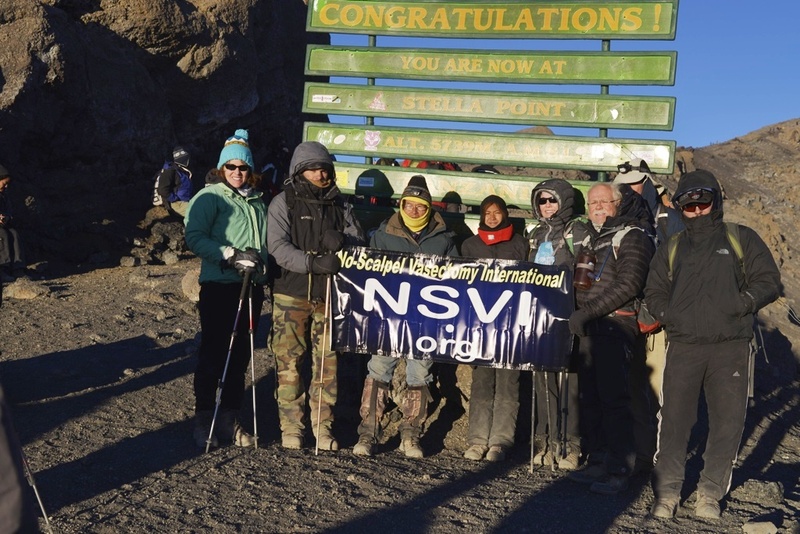 Dr. Ramon Suarez, President and Co-Founder of NSVI (in the yellow hood), has reached Stella Point on the rounded summit of the highest peak in Africa. At 5,745 meters, Stella Point is just shy of Uhuru Peak (5,895 meters), but attainment of Stella Point is considered a “summit” in mountaineering circles. 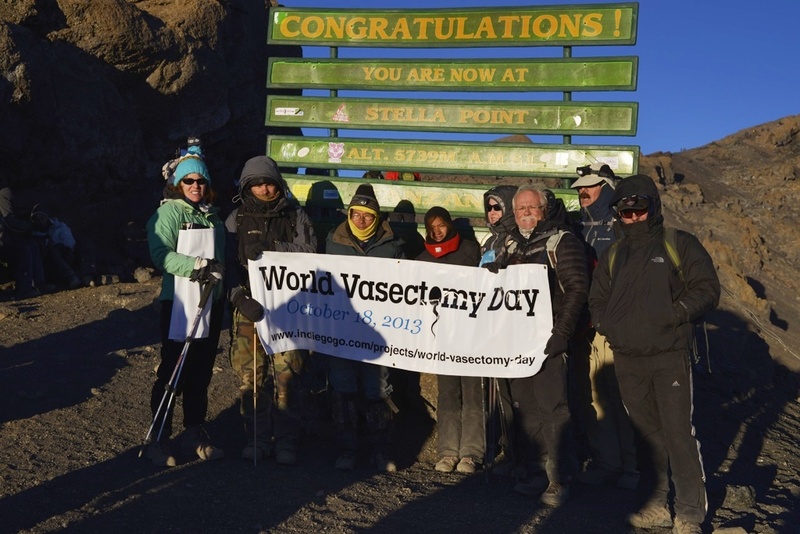 Dr. Suarez also raised a banner to announce World Vasectomy Day on October 18, 2013, a celebration in honor of those men who play a role in family planning and do what is right by their partners, their children, and their planet. Ramon is accompanied by a group that includes Maryann Stein (left), wife of NSVI Development Director Doug Stein, his 16-yo granddaughter Alexa Suarez (red collar), Doug”s cousin Steve Stein (no hood or hat), and Steve’s sons William (right) and Stefan (2nd from left). Congratulations to Ramon and all in his group. Well Done! !